The weather in Moore is normally delightful – BUT – we do occasionally witness the power and ferocity of severe thunderstorms. What should you do when severe weather threatens, what shouldn’t you do, and what do our authorities do. These factors are why it is important to cover yourself with a heavy coat or blanket (in an attempt to stop/slow the debris), and to take shelter under something sturdy, such as a heavy desk. A WATCH is issued when expert convective storm meteorologists at the Storms Prediction Center in Norman determine that severe thunderstorms or tornadoes are possible. These watches are generally issued for large areas, such as all of western Oklahoma. A WATCH means to continue normal activities, but to keep an eye to the sky. As with the warnings as listed below, severe weather watches are issued for potential tornado, severe thunderstorm, and flash flood events. A WARNING is issued by meteorologists at local weather service offices when severe weather or tornadoes are actually occurring. Warnings are generally issued for very small areas, such as a single county or groups of 2-3 counties. When a WARNING is issued, you should TAKE COVER IMMEDIATELY if you are in the path of the storm! Three types of WARNINGS are issued for severe storms: TORNADO WARNINGS, when tornado conditions have actually been observed or are imminent based upon radar information; SEVERE THUNDERSTORM WARNINGS, where storms are producing straight line winds of 57 mph or greater, hail 1” diameter or greater, and/or are capable of producing a tornado; FLASH FLOOD WARNINGS, where streams, creeks, or urban waterways are flooding or will be very soon. In Moore, our Emergency Management staff works closely with the meteorologists at the National Weather Service Forecast Office located in Norman. NWS personnel will generate warnings based upon not only radar information, but also information from our Moore severe weather spotters that are in the field. Therefore, when a warning is issued for Cleveland County, our EOC staff normally have played a part in the decision process. 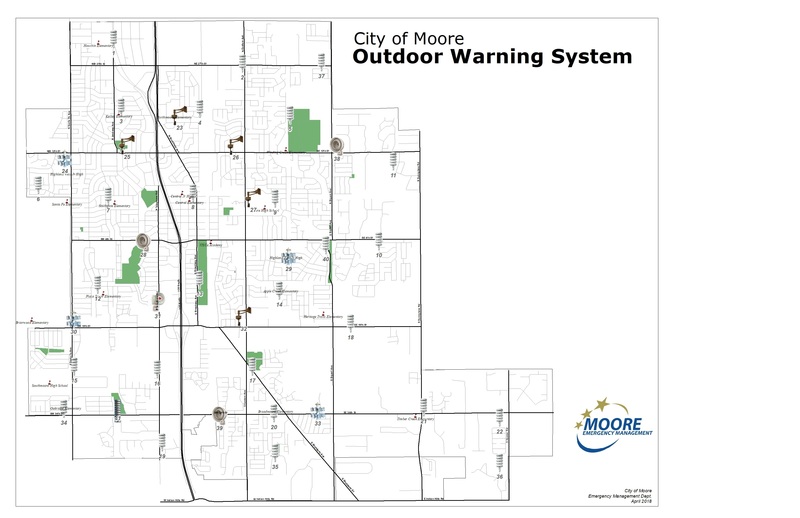 If our EOC staff determine that tornadic conditions will directly affect Moore, we will activate our local warning system, consisting of an outdoor warning siren system and a cable television interrupt. The NWS office will be triggering the alarm on NOAA Weather Radio, and local media will be broadcasting the warning as well. During severe weather warnings, there are a few things NOT to do: First, don’t go outside or to a window to look around. Instead, take shelter immediately and gather information on the storms via a portable battery powered NOAA Weather Radio, commercial broadcast radio or television. Don’t call 9-1-1 or the Police/Fire Departments for information on the storms or where to shelter. Know ahead of time where to take shelter, and as noted above, get information on the weather via radio or TV. 9-1-1 should never be called unless you have an emergency, and our Communications, Emergency Management, Police, and Fire personnel are typically extremely busy during severe weather events. Don’t take a shower or bath, use a regular wireline telephone, or use a computer connected to a modem. Should lightning strike nearby, the electrical current could travel through the telephone line or the plumbing to you. Finally, don’t take shelter under a highway bridge. Click on the next page for more information on this. Tornadoes are the most violent atmospheric phenomenon on the planet. Winds of 200-300 mph can occur with the most violent tornadoes. If a tornado was approaching, would you know what to do? The following are instructions on what to do when a tornado warning has been issued for your area or whenever a tornado threatens. In homes or small buildings, go to the basement (if available) or to an interior room on the lowest floor, such as a closet or bathroom. Wrap yourself in overcoats or blankets to protect yourself from flying debris. In cars or mobile homes, abandon them immediately!! Most deaths occur in cars and mobile homes. If you are in either of those locations, leave them and go to a substantial structure or designated tornado shelter. If in your car, remember that highway bridges are not designed as tornado shelters, and make for very poor shelter. Actual tornadoes – on the ground, causing damage – do NOT occur as frequently in Moore as one might think. According to the National Weather Service storm database for Cleveland County, about a dozen tornadoes have struck Moore or the immediate area in the past 50 years. Of these, only two have been significant in terms of destruction and fatalities: an F3 tornado that struck on November 19, 1973; and an extremely violent F5 tornado that devastated the northwestern part of Moore on May 3, 1999. However from these dozen events, there are only 7 known fatalities (five of which occurred during the 5/3/99 event). Go to a safe shelter, such as inside a sturdy building, immediately! A pickup truck or hard top automobile with the windows up can also offer fair protection. Most open park shelters and pavilions do NOT offer good protection. They can occur anywhere, along rivers or creeks, in low water crossings or in a dry stream bed. They can occur during any month and at any time during the day. In fact, flash floods often occur at night when it is difficult to find an escape route. Flash floods can be deceptive. Flood waters are likely deeper and moving faster than you think. Most cars and light trucks will begin to float in as little as 1 to 2 feet of water. Everyone, especially children, should stay away from flooded creeks, streams or drainage ditches. Soggy banks can collapse, dumping you into flood waters. Flash Floods develop quickly. They can occur anywhere, along rivers or creeks, in low water crossings or in a dry stream bed.